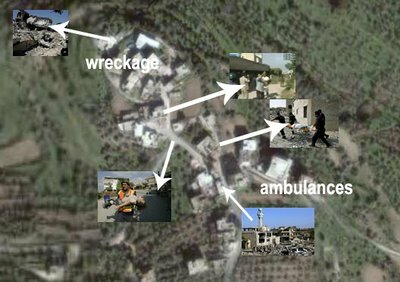 Many readers have been asking us to put up a map or satellite picture of Qana showing the location of the wrecked building and the other important landmarks. This has proved difficult, not least because the site is not actually in Qana. It is in fact the hamlet of Khuraybah, one mile to the north of Qana. Anyhow, I've posted up a first, rather amateur version, showing some of the landmarks. We hope to improve on it in due course. At last, however, we have a clear idea of the route taken.